May Day celebrations in London went ahead peacefully with scaled down security and less than half the number of officers involved than last year. Intelligence had suggested anti-capitalist demonstrators would switch their focus to EU ceremonies in Dublin. About 1,800 police officers were assigned to provide cover in London for any unexpected protests, traditional marches and six football matches. In 2000, anarchists ran riot and defaced the Cenotaph in Whitehall. But in recent years there has been little trouble and the London Mayday Collective cancelled its protest for the first time in five years. This year it held a picnic in St James's Park instead. Why no mass May Day protests? According to the Metropolitan Police, there were only about 1,400 people at the gathering point in Farringdon where the rally started, but the TUC set the number of participants at about 5-7,000. 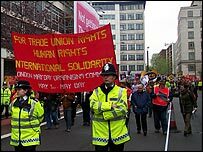 Roger Sutton, of the London May Day Organising Committee which has marked May Day for more than 110 years, said the TUC workers' march was "bigger and better than ever". He said over the past couple of years trade unions, political groups, and the anti-capitalist globalisation movement had come together to celebrate the day. "This year the issues of global exploitation of people and environment, sweated labour in the sports clothing industry in Olympic year, the need for peace in the Middle East and the disaster of privatisation in rail, health, education will be uniting people." A Metropolitan Police spokeswoman confirmed 1,800 officers were being split between 32 boroughs, compared to 6,000 in 2002 and 4,000 last year. The spokeswoman said: "We are bearing in mind the significance of the date and the fact that those who have historically taken part in demonstrations do not tend to enter into negotiations with police. "All London forces have worked together to put in place a joint operation that will allow us to deal with any eventuality." The march went from Clerkenwell Green in Farringdon to Trafalgar Square where a rally was addressed by Mayor of London Ken Livingstone, union officials and a member of Globalise Resistance.